Way back when I was in Junior High school I was an awkward kid -- fat, didn't have a lot of friends, and too smart for most of my compatriots. I'd walk to school with a transistor radio stuck to my ear for company. Back in those days we didn't have i-Pods, or cassette boom-boxes or Walkmans, we had radio. Good old fashioned broadcast a.m radio. I'd listen to KSOP and KRGO in Salt Lake -- both country stations. That too was a problem because I was the only kid in school who liked country music, and the kids would make fun of me for that as well. But radio was my friend. And I'm sure that's why I always wanted to be a radio DJ when I was in Jr. High and High School. 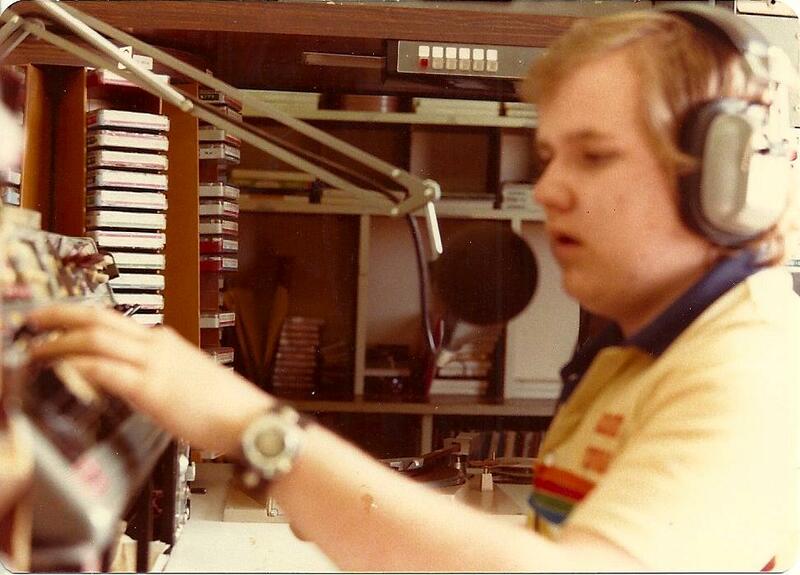 So I studied for and got my Federal Communications Commission license when I was 16, I hung around radio stations, and I finally landed a job at one in 1978 when I was 17 (which is a story for another day). 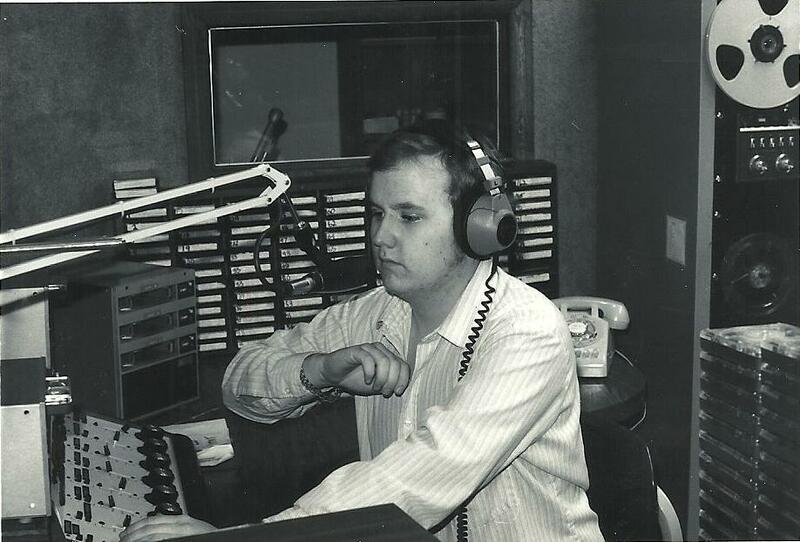 I worked in radio and TV all through High School and College and beyond -- for minor and major stations in the Salt Lake City metro area and in Phoenix. I finally got out of the business when I moved from Phoenix to Seattle, even though I had offers to work for stations here. 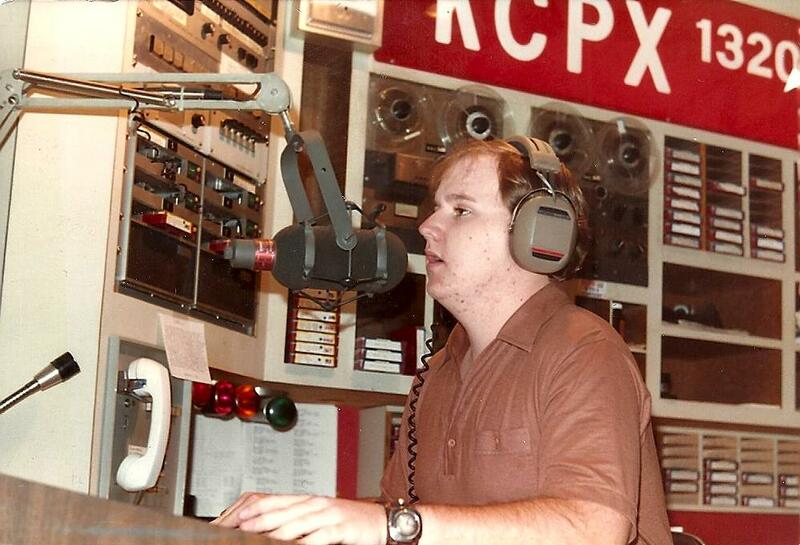 These old pictures bring back so many memories of great old stations that no longer exist as they did back then -- KCPX, KBBX, and KZAN, all in the Salt Lake City metro area. You can tell how long ago this was by the rotary dial telephone in the background on the bottom picture, taken at KZAN in Ogden, Utah. That and I actually had hair back then too. By that time I moved to Seattle I didn't need to work in broadcasting for the income, and I wanted my weekends free so I declined the offers from stations here. I still enjoyed listening to the radio though, and I kept in touch with a few of my former colleagues who stayed in the business, and that's what this post is about. You see the last of my old radio friends passed away this last week quite suddenly. And it seems that now, at age 53, I'm the "last" of my generation of radio people. That's knda scary. My closest radio friend and mentor, Mike Bryant passed away back in 1996 of AIDS. 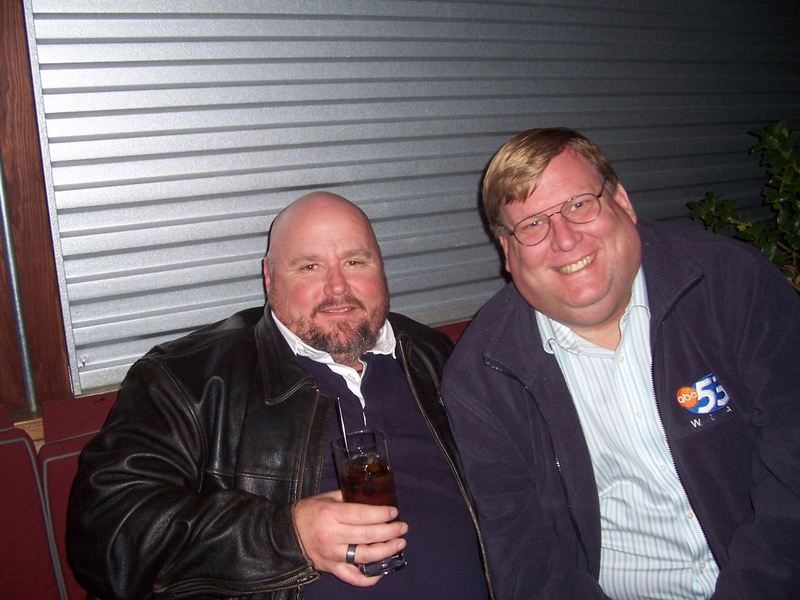 Mike was my first radio friend and the one who taught me much of the business. Then earlier this year in March, my dear friend and fellow country music DJ Wade Jessen who had worked with both me and Mike in Salt Lake City, died quite suddenly of a heart attack. I'd just had a wonderful dinner with Wade and his partner who were in Salt Lake City this past Christmas visiting Wade's family. Wade and Corey lived in Nashville where Wade, who still was working in radio -- albeit the non-traditional broadcast medium of Satellite Radio for Sirius XM. We spent much of the dinner reminiscing about the old days and lamenting what has essentially become the death of broadcast radio. I wish I had the picture from that dinner -- we took one on Wade's phone but he never got the chance to send it to me before he passed. And just this past week, a guy who was like a big sister to me, Jim Fordyce, died suddenly of a blood clot in his lung after having lunch with a friend of his in Palm Springs. I'd spoken with Jim just hours before about a project we were working on, and then later that day I heard from his partner Kevin that Jim was gone. The past two winters while I was in Palm Springs I'd spent a lot of time with my old friend, who had moved to the desert and set up a couple of "internet radio stations" and had a syndicated travel show on several California radio stations as well. He did it all from a studio in the house he shared with Kevin in Cathedral City. Jim had used me as the "voice" to introduce some of his shows on his Internet station as well as some narration projects this past year. It allowed me to once again enjoy being "on the air" in a way, and to be working again in a radio studio. I had met Jim when I was living in Phoenix -- I was working at KNIX and he was working at KOOL -- at the time, two of the biggest stations in Phoenix. 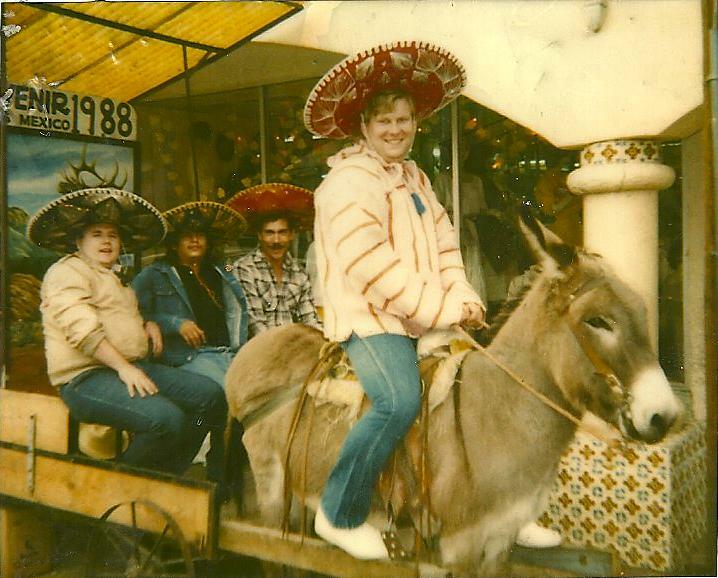 We became fast friends and spent many a hot Phoenix summer night on the patio of the now long-gone dance bar called "Connections" on North Seventh Street, drinking Coke that had been imported from Mexico and talking radio. This picture was taken of us in 1988 shortly before I moved to Seattle. Jim and I along with my boyfriend at the time Ruben and Jim's boyfriend at the time who's name I forget, all went down to Nogales, Mexico for a weekend. Jim's sitting on the donkey, stealing the show as he always was able to do with his larger than life personality. Jim was born and raised in Upstate New York and had the personality to match his home state and his size -- big. Like my other radio friends Mike and Wade, we all had the ability to talk and talk and talk, about nothing at all or something substantive, and be able to fill time to the second. "Dead air" or silence with no one saying anything was non-existent with all of us. To this day I can still talk in nearly exact 30 second bits without a clock telling me the seconds. We all loved the business we were in. Radio is very much a solitary thing -- sitting in a dark room all alone, the lights from the console glowing, the music pulsing, the clock ticking, putting on headphones and throwing the switch to open the microphone and introducing the record, selling a product, reading the weather, and best of all, talking right up to the very second the singer of the next song started singing or the jingle singers started their routine. There was a "high" we all got when one could do a weather forecast and end with perfect timing along the lines of "and right now it's 78 degrees in Phoenix!" just as the chorus of jingle singers sang out the call letters of the station. And whenever Jim and I were working on a project in his studio in the desert we'd get sidetracked talking about the old days and we'd dig up recordings of singing jingles of call letters and station ID's and play them for hours. What would have been a half hour project would stretch to three or four hours. Kevin would roll his eyes, tell us to get back to work and stop playing jingles and he'd go out for a drink. Three hours of a chorus of jingle people singing "Musicradio! seventy-seven, W-A-B-C!" over and over would get to anyone who wasn't an ex radio person, and only an ex radio person would understand why we loved it so much. I left Phoenix in 1989 and Jim left a few years later. I came to Seattle -- he went to Salt Lake and then on to Flint, Michigan and then to Lansing, Michigan. We'd talk often and after email became a thing we'd send emails all the time. Tony and I were in Chicago in 2007 and Jim took the train over from Michigan and we all hung out and a bar for the evening. Tony quickly got bored of the radio talk, but Jim and I laughed till we couldn't walk anymore over some of our old Phoenix antics. Shortly after that Jim got out of traditional broadcast media and moved to Palm Springs to start his Internet radio stations and to get out of the cold of Michigan. I'd see him and Kevin when I'd go to Palm Springs on vacation, and saw them often the last two winters that I've spent there. Jim had made friends with a number of old radio and broadcast personalities who have retired to Palm Springs and we were always talking about having a big dinner party where we'd all tell stories and play old show tapes of ourselves, and most importantly, listen to and sing along with call letter and station ID jingles for hours. But unfortunately now we won't have that party. I'm going to miss the almost weekly lunches with Jim and our studio time and our jingle tapes something fierce. Radio as we knew it and as we grew up with, is dead and gone, and I have no one to share those days with anymore. People rarely listen to broadcast radio these days even in cars as they come equipped with i-pod connections, satellite radio, and even Internet streaming capability. Folks have forgotten about the free over-the-air broadcast stations for the most part -- who needs them when everyone can carry around an entire radio station that they program themselves in their pocket and never have to listen to a commercial? I am just as guilty of this as the next guy. But in my mind I often travel back to the days when radio was the way we listened to music -- when DJ's and radio personalities were famous, and when stations sang out their call letters with catchy jingles. I can see myself sitting in a dark room in front of a microphone, talking to no one I can see in front of me, and yet to thousands of people out there somewhere listening to my voice as it magically came to them over the air. Those days are gone, and all my friends I worked with are now gone too. And although I'm not, I kinda feel like the last survivor of an extinct species with no one left to share this part of history with anymore -- no one that lived it with me and worked at the same places. Someone who remembers a reel-to-reel tape deck, a "cart", how a mixing board works, and how to match the jingle tempo with a song tempo. Someone who knows how to make a bland boring weather forecast into a fun casual conversation with an imaginary unseen friend. Someone who knows what "top of the hour" and "bottom of the hour" means, and how to talk for exactly 7 seconds of the 8 seconds that start a song, saying "Hi there! It's 10 o'clock. I'm Gary Gardner and you're listening to KNIX-FM, Phoenix!" ending a beat just before the singer starts to sing. So tonite I'll raise a glass and toast those days, and my fellow radio personality friends, Mike Bryant, Wade Jessen, and Jim Fordyce. Because broadcast radio waves travel outwards forever to infinity, their voices -- and mine -- are still wafting out in space at the speed of light as we speak -- growing ever fainter as they travel further and further out. In this way they -- we -- will live on forever, and so will the golden days of music radio. And I'd like to think that somewhere out there someone with right technology will have the capability to listen back in time to our broadcasts, and will laugh at our corny jokes and smile when we "hit the post" with a perfectly timed weather forecast leading up into a rousing singing jingle station ID. Here's to you my friends, and here's to radio too. I miss you all. Gary, that was absolutely beautiful and it brought a tear to my eye. God bless you, brother. Now I really feel bad for missing your last visit to New York. Feel the loss of your friends, but not too much where it hurts your spirit! You've forged a wonderful life and are still loved and admired by many, including me. I still think of your words regarding not fully understanding racial disharmony but being willing to listen, which spoke volumes to the kind person that you are. Continue being "that guy" to people you know and those friends you've lost will continue living through you. Well said Gary. We have lost another great individual. We all have to pass on in time but Jim's time was to soon. He will be greatly missed.